Who doesn't love eating snacks? These order-takers offer a wide selection of tasty snacks from crunchy nuts, to chocolate delights and assorted candies. Your supporters will be tempted to buy several items each, so wait no longer- select your favorite snacks order-taker and get started today! 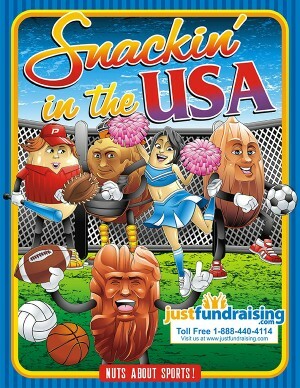 Make your next fundraiser a Snackin' in the U.S.A. one! Snack lovers are sure to find all their favorites here! 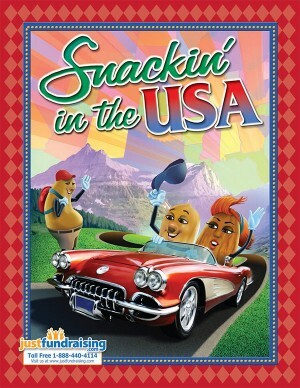 A mouth watering selection of 20 delicious, sweet snacks and savory treats for only $8 each! NEW - Perfect for Team Fundraisers! This is the perfect order-taker for sports teams and sports fans! It offers the same delicious selection as Snackin' in the USA, but it is sports-themed to complement your group's team spirit.